Submitted photo Scholarship award winners include Katherine Scudder, Jay Davidson, Adam Westergaard, Andrew Haberlandt, Joseph Derrico, Jonah Trillana, Ryan Dahlinghaus, Megan Subr, Rylie King, Thaliyah Cools-Lartique, Carmen Williams and Kathleen Giffin. Not pictured: Kaitlin Belliveau and Kyla Frye. 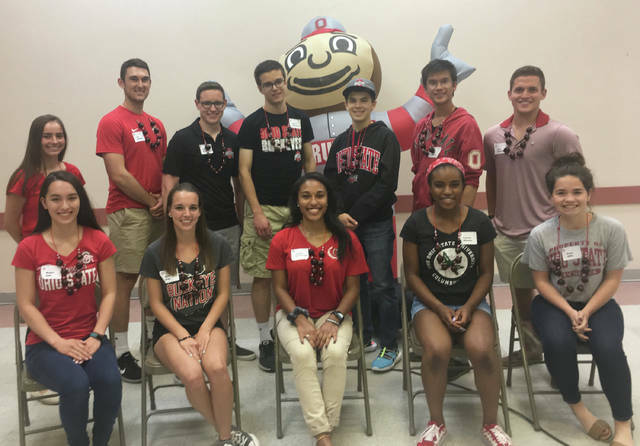 GREENE COUNTY — The Ohio State University Alumni Club of Greene County is awarding 14 scholarships for county high school seniors graduating in 2018 who will enter OSU in August. Greene County scholarship winners are: Jay Davidson, Rylie King, Megan Subr, and Carmen Williams from Beavercreek High School; Joseph Derrico, Kathleen Giffen, Andrew Haberlandt, and Adam Westergaard from Bellbrook High School; Ryan Dahlinghaus and Kathleen Scudder from Carroll High School; Kaitlin Belliveau from Cedarville High School; Thaliyah Cools-Lartique from Fairborn High School, Kyla Frye from Xenia High School and Jonah Trillana from Yellow Springs High School. Each scholarship granted is for $1,000. The awards are funded by the support of local alumni. John and Cindy Feltz of Fairborn and Eric and Lela Marcus of Beavercreek set up endowments in addition to the club’s initial endowment fund. The funds from these endowments generate earnings to enable the local club to offer more scholarships for students. Scholarship applications are distributed to all Greene County high school counselors in the fall of each school year and then qualifying applicants are interviewed to select the merit-based award winners. Members serving on the Scholarship Interview Committee this year were Kylie Sobota, James Root, Ron Stauffer, and chairperson Christi Guillmen. Scholarship recipients and their parents were recently honored at an alumni gathering held at the senior center in Fairborn. Tamar Chute, a university archivist and professor, spoke about OSU history. Don Kitchen has served as president of the alumni club over the past year. Newly elected officers for the 2018-2019 year include John Feltz, president; Becky Mann, first vice-president; James Root, second vice-president; Cindy Feltz, secretary; Don Kitchen, treasurer. The next event for the club will be the 18th Annual Student Send Off Picnic, 2-4 p.m. Sunday, Aug. 5 at Fairborn Community Park East. All Greene County high school graduates who will enter OSU as new students this fall are invited along with their parents, siblings, and friends. Special guests will include upper-class students who will serve on a question-answer panel. For more information about membership and activities of the OSU Alumni Club of Greene County contact John Feltz at 937-878-2895 or JFeltz@aol.com or visit the club’s website at www.greenecounty.alumni.osu.edu. https://www.xeniagazette.com/wp-content/uploads/sites/32/2018/06/web1_2018-Award-Winners.jpgSubmitted photo Scholarship award winners include Katherine Scudder, Jay Davidson, Adam Westergaard, Andrew Haberlandt, Joseph Derrico, Jonah Trillana, Ryan Dahlinghaus, Megan Subr, Rylie King, Thaliyah Cools-Lartique, Carmen Williams and Kathleen Giffin. Not pictured: Kaitlin Belliveau and Kyla Frye.